UPS delivered this book last night, and I am pouring over every little word and idea! Love love love it. Having a hard time working today, because I just want to pull this book out of my bag & spend more time with it.If you love Ali's blog, this book is a MUST-HAVE!!! !edited 1/18/08: finished this book last night. loved every bit of it, but one of the most important things you'll get from this book is a reminder that it's so so so important to simply BEGIN. get your stories written down, your life and memories documented. it doesn't have to be perfect. you don't have to love every scrapbook page or art journal entry. just record the memories, because someday your family is going to look back and be so thrilled that you recorded such rich details about your life. ali is an inspiration. This book was eye opening to me. I hadn't looked at scrapbooking the way that Ali does in her book. I have been doing more spontaneous photo taking rather than just holidays, or timeline type pictures. Great read and it's so Ali! Do you have an obscene volume of photos & feel that nagging to do something with them? Before you think "ugh, scrapbooking" you have to read this book! I poured through this over a few hours in one night and felt inspired and motivated. Ali Edwards is all about stories + photos as simple as that. That can take many, many forms for different folks, but if you truly love telling stories of your life through words & photos you have to read this book. Also, there are some amazing quotes she uses throughout the book as well. I think this book really would be a valuable tool to any blogger, writer or journaler, photographer, or creative arts individual! Her website & blog are full of lots of other great stuff too! www.aliedwards.com "you will grow in understanding of yourself if you're willing to take the risk, willing to tell your own story..." - Ali EdwardsOne of many Ali quotes - "Life is the supreme creative act. We are always choosing, shaping, improvising, with what arises around us. The more we accept what is happening and let go of what we think should be happening or what we want to happen, the more free and alive we become." - Jennifer LoudenThe only challenge is finding a copy of this... it is out of print I believe and goes for big $ usually on Amazon. If you only buy one book on scrapbooking in your life, let this be it.Seriously. Because this book isn’t just about seeing great layouts and scrapliftable projects (though there’s plenty of that). It’s about a realistic scrapbooking philosophy that will help you keep to scrapbooking for the long hall. It’s about making your work really reflect you life. It’s about letting go of your fears of imperfections and just going for it. It’s about keeping it fun.Another great thing about this book is it’s all Ali. Most scrapbooking books consist of several contributors so you can see varied styles. While that is generally awesome, I love that this one is packed full of 100% layouts that I love. If you like her work, you know you’re going to like everything in here. read: 2011 February.read: 2012 March. The overwhelming trend in the world of "scrapbooking" is a huge emphasis on piles of popular products. I abhor this. Ali Edwards is refreshing. Yes, she uses a lot of products. However, her main impetus is a focus on stories + photos. The rest is just framework. She is a graphic designer who brings her knowledge-base to simplify this world of too-much. Creating "life art" is to celebrate the stories of our lives. I reread her book occasionally to inspire me, to refresh my own sense of art, and to boost my impetus to not allow the beautiful simple stories of my life to fade away. This was a great companion book to Stacy Julian's The Big Picture. Ali Edwards has put into words what I've been feeling about scrapbooking... just taking pictures and getting the stories told. Really inspired by the whole Week in the Life project and decided to tackle that because it's not hard, it's not complicated... take pictures, write notes about a typical week in the life of our family. Simple. Meaningful. I love Ali Edwards so of course I knew I would love this book. She is extremely inspiring and passionate about her work as a scrapbooker. In this book she coins the term "Life Artist" to explain what she does professionally and as a way to document and preserve her life stories. Ali is well-known in the scrapbooking industry and also has other great books out (plus one in the works) that are sure to inspire you to get started or keep at this wonderful and important hobby. Such an inspiring read! Been a fan of Ali for a while and was fortunate to take a class with her. She has a great personality and it shows through in this book. I've been feeling the need to change my approach to scrapbooking for a while now, and this was just the trigger I needed. Makes me want to spend more time on the pages I create and the ideas and stories behind them, rather than just trying to get pages and photo sets completed. I look forward to trying some of her challenges and ideas. The best part of this book, for me, is Ali's work - her projects, canvases and layouts. I love flipping through the pages and just looking at the pictures and have been inspired by her work. The narrative of this book wasn't as useful to me as her first two books where she's discussing design principles. I'm a big Ali Edwards fan - and this book is really a good one. I'm going to return to this when I get a bit more time and take her challenges and I'm confident that my scrapbooking will evolve a lot from this. I love her focus on telling the story! - been using that since starting to read her book and it actually makes it easier to scrapbook - for me at least! This book is the most inspiring book I have ever read in regard to art and creativity. The book offers a special philosophy which has manage to captivate me and to boost my creativity whenever I felt I'm on a rut. I have been reading it again and again and the words are still penetrating and thought provoking.In addition I really enjoyed that the book contains only the author's creations. I love Ali Edwards' style and writing. I also enjoyed getting to meet her at a CKU a couple of years ago -- really nice, really down to earth, and really funny!! I enjoyed this book tremendously. Actually, I liked it more than her previous book on using patterned paper -- different feel and different sense of real-ness. While this is technically a scrapbooking-section book, it's much less about making layouts than it is about finding your creative voice and fitting in the act of creation into your life. Allie is wonderfully inspiring, and I'm looking forward to finishing this one. I am a HUGE Ali fan. I find myself going back to her books whenever I hit a speedbump in my creative process. Her inspiration and honest approach to life is totally refreshing; she has an amazing spirit that comes out of her work and into your life. Ali Edwards is a Eugene, Oregon artist whose Life Art is an inspiration to me. She weaves her daily life, photography, writing and journaling into her art. She makes connections between the past and the present while celebrating the changes her life brings her. I love her style. I love anything by Ali Edwards, this is no different, but it wasn't as good as A Designer's Eye and Designer's Eye for SBing with Patterned Paper. I ate the first two books up. Still motivating, though. - That it's OK: that I don't scrapbook every day, that I can't afford to part-own the nearest Archviers, that I don't have a crafting background, that I don't have the best camera, scanner, computer, that Photoshop is not the only way to edit...A.E. showed how it can and SHOULD be fun! Fabulous go-to book for any scrapper! Even scrappers that have been doing this for years, will love the ideas and inpiration in this book. Ali's ideas are fresh, and yet work for every style out there! I am a huge fan of Ali's approach to scrapbooking. Clean. Fun. Graphic. She captures all of that in her concept of Life Artist. Even if you've never come across her work, check out her usage of simple everyday embellishments to compliment the photos and the words. I love Ali's style and the way she views life and shows it through her scrapbooking. Great book for all scrapbookers - I keep picking it up and looking at it over and over again. This is my favorite to date! Ali Edwards is amazing. Love her designs-love her philosophies. My 3rd and favorite of her design books. Only complaint--wish it was longer. This book has changed the way I create. It has changed my definition of the world "artist" and really taken away the box that I was in. my favorite Ali book so far...nothing to do with the fact that Emma is on page 65. LOL. Very inspiring and lots of good, practical ideas. it is her best book to date. I love how much this book inspires! It makes me want to document & create! 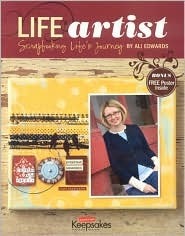 Life artist could not be a better companion book to any new scrapbooker!!!! if it tried!!!! Awesome! awesome book, will read through it again and again. such great inspiration!